The weather this weekend is looking to be nice and cool, and so we’re running a last-minute trip to Dreamtime Wall in the Grampians, in what will almost certainly be the last opportunity to get to this north-facing crag before it becomes too hot over summer. Dreamtime provides some really good sport climbing. There are numerous easy and mid-grade sport routes, as well as some harder ones, and the bolts tend to be much more comfortably (closely) spaced compared to some other parts of the Grampians. The routes are really varied, including some of the easiest sport routes in the Grampians, as well as some of the longest. If you can climb at least grade 17, there’ll be plenty there to keep you occupied for more than a whole weekend. The focus will be on leading, not seconding, and so in the terms of VCC Club Trips, it is mainly intended for “Advanced” climbers, however we may be able to accommodate a limited number of “Intermediate” climbers. We will be bush camping near the crag. 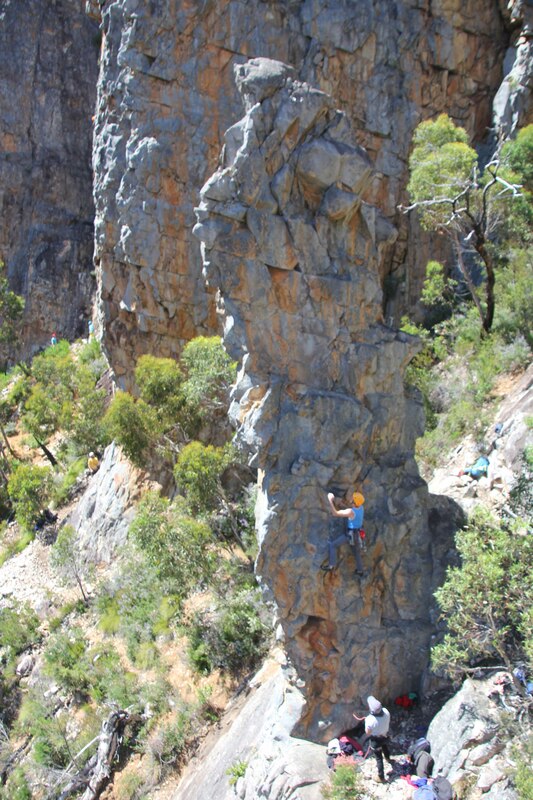 Photo: Michael O’Reilly leading 234 Duck (18) on Prince Albert Pinnacle, Dreamtime.